Desiring to slim your face and have a V shaped face? At A.R.T Aesthetics, we specialised in non-surgical jaw reduction procedures to help you accomplish that! Jaw reduction injection is a specialised technique to reduce the width of the jawline, changing an overly square jawline to a more attractive oval or heart shaped face. In some patients, the masseter muscle, a chewing muscle, is enlarged creating extra facial width. 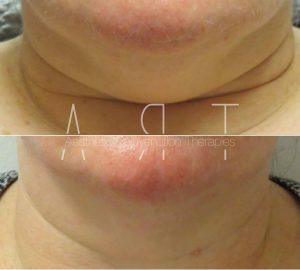 Jaw reduction injection selectively weakens this muscle over time leading to an overall reduction in the size of this muscle. The treatment is safe and effective. No other cells are affected during the procedure. Only the fat cells are frozen and naturally eliminated from your body. The result will show gradually in the following few months after your treatment. If you are interested in our Non-Surgical Jawline Reduction Injection and Jaw Slimming treatment, or would like to book your consultation, please call us on 01277 633907.